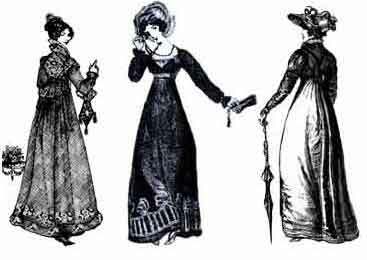 La Mode Bagatelle produced two exquisite 19th Century pattern sets, the Regency Wardrobe and the Victorian Artistic Reform Teagowns collections. Each collection includes a complete ensemble and represents the pinacle of historical patterns. La Mode Bagatelle was born as the joint venture of two independent costumiéres who combined their unique and extensive talents and training to produce gracefully rendered historical patterns. Susan Pasco is a costume enthusiast who, at the age of three became fixated on two posy holders, four fans and a pair of exquisite 1880's gowns in a faraway museum. She never recovered. Her paper doll and doll wardrobe were historical and vast. Anything involving fabric, color, texture, design and handwork were irresistible, studied in depth and put to use. Entirely self-taught, she believes that costuming is an art, not a science. Creativity, inspiration and flashes of brilliance rather than formulas, rules and imitation, are it's guiding forces. Handwork and embellishment are her mania and delight...no detail is too small, no effort is too great, no sacrifice of sleep too great when in the grip of a costume. To carry on the art and appreciation of handwork, textiles and all things related is her vocation ( She understands that there is no twelve-step program for this addiction). Tamara Fidler is a professional pattern drafter who rebelled against the modern garment industry's penchant for short-cuts, shady characters, and cheap fixes. She now lends her technical expertise to the difficult but far more rewarding art of historical pattern drafting. Both Susan and Tamara share a fascination with the reverence for silhouette, fabric color, and texture. 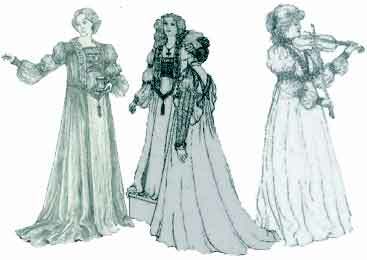 Their patterns provide not only the basic silhouette shape, absolutely essential as the foundation of the historical garment, but also an extensive array of instructions, suggestions and ideas for its embellishment, and a national network of resources. La Mode Bagatelle was founded as an effort to retrieve, preserve and share the genuine, languishing, costumiéres art, and as a philosophical protest against such incongruous modern practices as french handsewing by serger. Included therefore, are sewing techniques and tricks based on two lifetimes of knowledge and experience, both well-known and long-lost, as well as the occasional inspired innovation Susan and Tamara have developed through the years, inevitably in the wee hours of the morning. Both, they believe, are appropriate in the true spirit of the costumiéres tradition, which was above all one of creativity, resourcefulness, and an uncompromising insistence upon the perfect effect.